The Armenian flag features three horizontal bands of red, blue and orange. During ancient times, Armenian dynasties were represented on the flag by symbolic animals. During the twentieth century, the Armenian nation was represented by various Soviet flags. 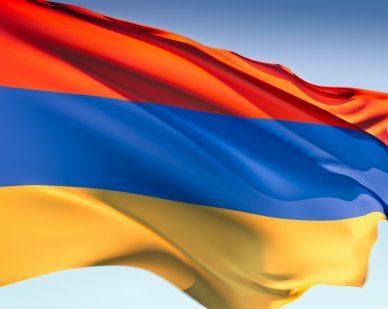 The color red that appears on the current flag represents the Armenian Highland as well as the peoples’ struggle for survival, maintenance of the Christian faith and the nation’s freedom. The will of the Armenian people to live beneath peaceful skies is represented by the color blue while orange signifies the creativity and hard-working nature of the Armenian people. Our top-quality Armenia flags conform to all official specifications. Emblems and designs are executed with the highest possible degree of accuracy in regard to detail, color shades, placement and proportion to flag size.